My name is Duana Pearson, and I work as a full-time horticulturist at the Eden Project in Cornwall, England. But this summer I’ve had the opportunity to travel and work at the Chicago Botanic Garden. 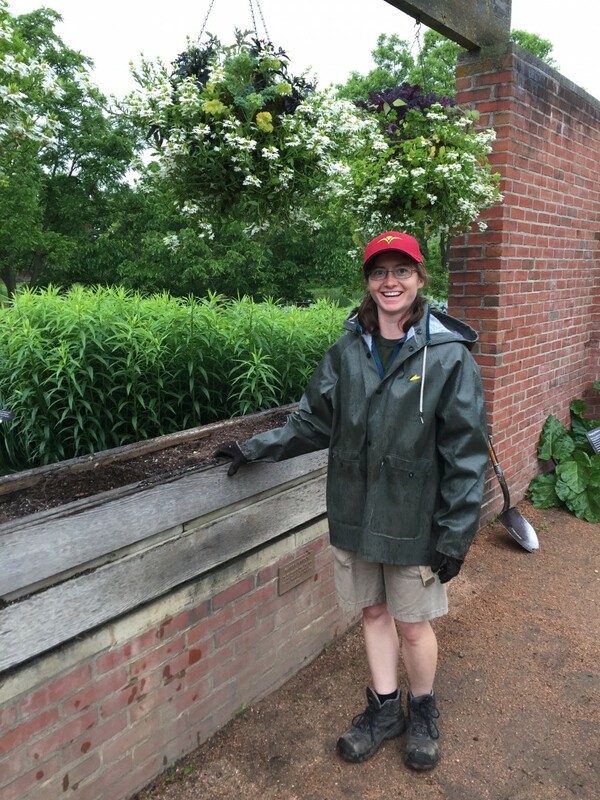 Visiting horticulturist Duana Pearson visits and lends a hand in the Regenstein Fruit & Vegetable Garden. When I first joined the Eden Project four and a half years ago, my role was to focus on outdoor crops. These days, that’s expanded, and I get to do a wide variety of tasks: I’m one of nine horticulturists in the outdoor garden, and my areas of responsibility include the Spiral Garden (our children’s garden), Myth & Folk—a woodland glen-type area, and a soft fruit garden. My most demanding and favorite area is Plants for Taste—an ornamental vegetable garden where I demonstrate beautiful vegetable varieties, edible flowers, and companion planting. This was the first area I was given when I joined the Eden Project, even though I didn’t have a lot of vegetable-growing experience. It’s a high profile part of the garden too, so I’ve had a very steep learning curve! This is why I chose to spend most of my time at Chicago Botanic Garden in the Regenstein Fruit & Vegetable Garden. I’ve wanted to experience working in other botanic gardens for some time now. When I started looking at options last year, the Garden’s Fruit & Vegetable Garden really attracted me. Thankfully, I was able to put together a project—two weeks volunteering at the Chicago Botanic Garden, plus attending the American Public Gardens Association conference in Minneapolis—that successfully received support and funding from my employer, the Royal Horticultural Society, and the Merlin Trust. But rather than just share a diary of my time in the Garden, I want to talk about food. While working here and talking to other horticulturists in the Garden, we discovered some culinary differences—my favorite was rutabaga. Firstly, in the UK, we call it swede. From what I understand, people in the United States don’t mind eating it in autumn, but few really like it; and mostly it’s fed to animals. 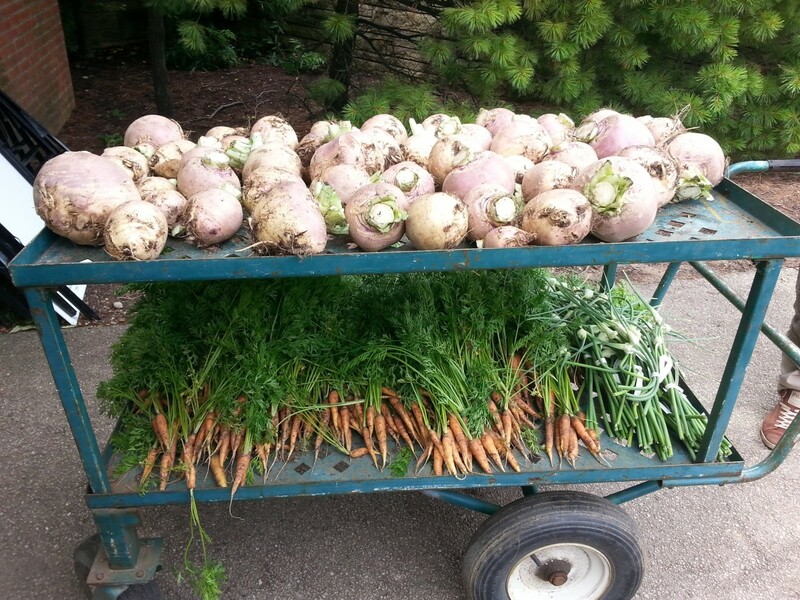 A cartful of Laurentian rutabaga, plus carrot cultivars ‘St. Valery’ and ‘Danvers’ just harvested July 8—all from 1890s vegetable beds! Well! You can be forgiven for not knowing this, but swedes are an essential ingredient in one of our national dishes, the cornish pasty. Steeped in history and beef, cornish pasty is considered Cornwall’s national dish. You will find versions of the traditional pasty—claimed to have originated as a meal for Cornish miners—wherever those miners moved, and I would love to pass this delicious dish on to you. Swedes are a home garden staple, and I hope you will make them a part of your garden, too. Disclaimer: I am not Cornish!—though this recipe has come from a real Cornish lady. In 2011, the cornish pasty was awarded a Protected Geographic Indication. This means that only pasties made in Cornwall, following the traditional recipe, can legally be called (and sold as) a “Cornish Pasty.” You can call them steak pasties instead! Enjoy! Preheat oven to 425 degrees Farenheit (220 Celsius). Mix the dry ingredients together, and cut in very cold fats with a knife. Add water a bit at a time until dough just comes together. Wrap dough ball in plastic wrap and chill for 30 minutes. Knead, but don’t over-knead, or dough will go tough. Roll out the dough, and place a dinner plate over the dough to cut out a circle. Fold the pastry edge up over the innards. It won’t look like it will fit, but be gentle and it will go. Crimp the edges shut using your fingers—we don’t approve the use of forks to do this! Make a slit on the top of the pasty to let out steam as it cooks. For a golden-brown finish, whisk an egg and apply egg wash to the pasty before putting in the oven. Bake for about 30 minutes until done. For presentation: Cornish men think a pasty should at least meet the edge of the plate you are serving it on. If not, hang the pasty over the edge. *Note for Americans: shortening can be used in place of lard. We at the Garden have attempted to Americanize the measurements in our translation of this recipe—at least for the pasty crust.